My favorite kind of clothing! A lot of these pieces I've already written about for Sunday Vintage, so I'll keep those descriptions brief. But luckily there's a few that I haven't written about so that'll be fun to share some insight with you all! 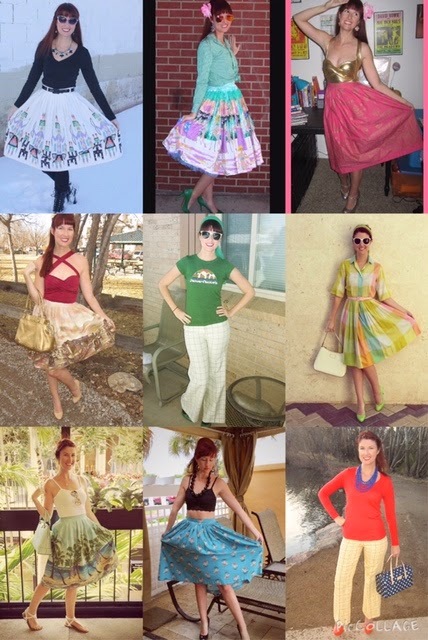 And if you haven't checked it out already, read this link to get into the Instagram party that showcases your REAL vintage outfits! I wrote about this skirt for my Winter Round-up so I'll keep this brief: the long and short of it is that it was super fun to winterize one of my favorite skirts that I generally consider a summer skirt! I did a Sunday Vintage piece of this beautiful skirt. I took this photo in the dead of winter and boy did it make me long for warmer days!! Wearing this Bernie Dexter bodysuit and sparkly Mary Jane heels was very fun to bring out the gold in this outfit. Read more about it here. One of the luckiest eBay finds ever! All about this skirt here! Another Sunday Vintage post (the next one won't be). This one is a good read because it explains shopping for vintage pants versus skirts. Click here to read about those differences. I'm obsessed with this particular Buffalo Exchange in Denver that carries some awesome vintage pieces for a lot less than normal vintage stores. I brought this dress with me to a trip to Florida and it was the perfect brunch attire. The sleeves were totally different than anything I own because they're longer and baggier, but I think they're super fun. I own a lot of lime green so it was an easy choice to style it with those options first, and I thought the white Kate Spade bag balanced everything nicely. Another Florida trip outfit! 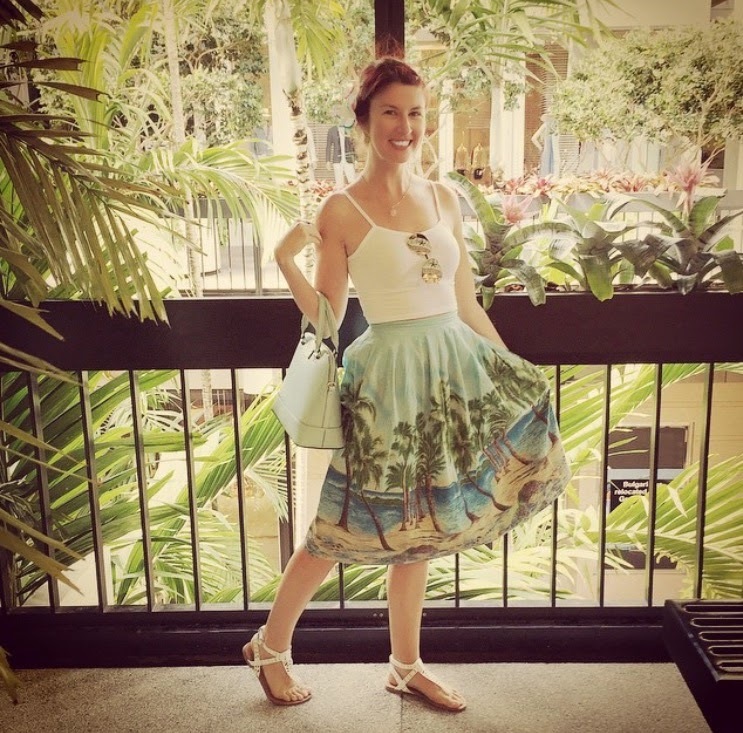 I mean, it would have been sacrilegious to not bring my vintage palm tree skirt to Miami, right? This was taken in Bal Harbor Florida specifically. My mom and I spent a morning there because our family actually used to vacation there so we wanted to see how it changed and how it's stayed the same. This was taken at a super ritzy mall where we were strictly window shopping, but a lot of sales people kept commenting on my skirt and asking where I got it. They were somewhat surprised it was vintage (I'm assuming that's because most people that shop there don't wear old clothes??) but they really seemed to like it! This is a failed outfit from Florida, meaning it was so windy and rainy out of nowhere that I had to change. But luckily I was able to get a few photos in for a future Sunday Vintage, and you can view those here. 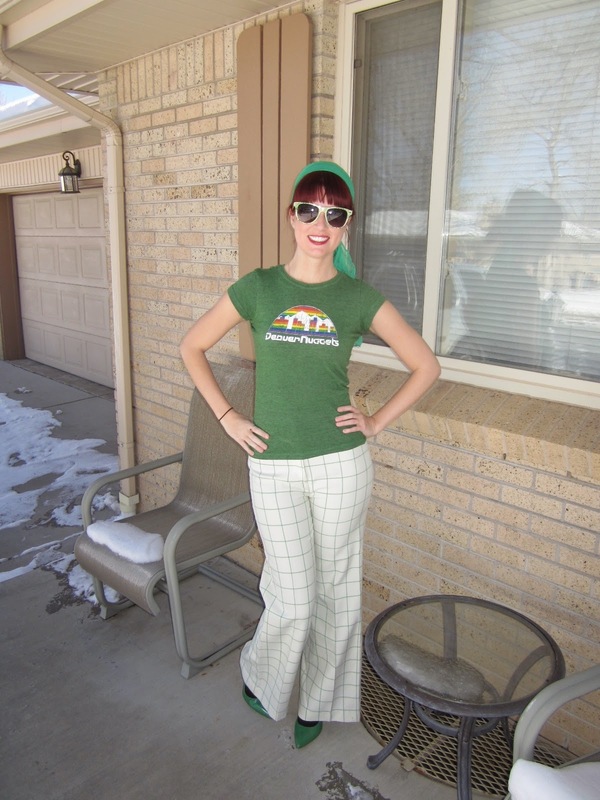 Vintage pants have been the best answer ever to all of my windy and brisk spring day wardrobe issues! I can wear dresses without tights on some chilly days, but wind is my least favorite element ever. Taking photos is a nightmare with wind because always having to keep your skirt down is annoying, plus wind makes everything colder. I found these awesome 70s pants on Etsy a few months back. 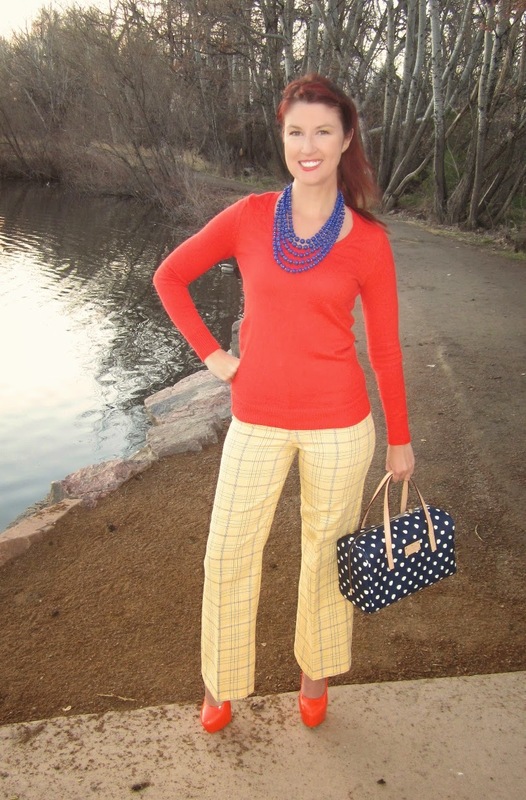 I never considered pairing the outfit with blue and orange, but on a surprisingly cold evening I found that my orange Old Navy sweater was one of the only warmer tops I had available that was clean and could match these pants. Pairing the orange shoes was a no brainer, but figuring out a necklace was a little harder. I'm just getting into jewelry as of recently and I've learned enough to know that this sweater in of itself was a little boring without some kind of statement necklace. There's blue in the pants so I opted for my blue beaded necklace that I found on ModCloth and used my navy polka dot Kate Spade bag to tie it together-as well as mix prints a bit. I'm not sure that this will rank as one of my favorite outfits of 2015, but I definitely like it and am happy with my improvisational skills as both pants and jewelry are slightly out of my league! Plus I kept warm that night!! Your novelty print skirt collection is AMAZING - especially LOVE the pool party print one!!! Thank-you! I love that my favorite pieces are so loved by such lovely Aussie girls!! My favorite dress on you is the big pastel check dress with that adorable pink belt! So glad you found a great vintage spot. Those are hard to find. Also, love the yellow pants with the orange accents. That is a really fun and sunny outfit. Thank-you! Vintage is my favorite! MWAH!! !